New data published by the Google-backed Measurement Lab gives a unique insight into the BitTorrent throttling practices of ISPs all over the world. In the U.S. and Australia most large ISPs limit less than 10 percent of BitTorrent transfers. In the UK and Canada on the other hand, some providers interfere with up to three-quarters of all BitTorrent traffic. New data collected by Measurement Lab (M-Lab) shows how frequently Internet providers limit torrent traffic. Previously the researchers published data up until 2010, and now the results have been updated to include the first quarter of 2012. This allows us to give an overview of trends and changes that have emerged in recent years. BitTorrent throttling in the US is not as prevalent as it used to be. The main reason for this is the Comcast BitTorrent blocking controversy which started in 2007. 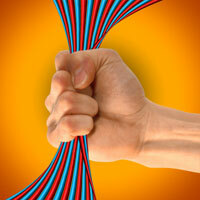 The FCC eventually ruled that Comcast had to stop its targeted interference of customers’ BitTorrent traffic. As a result of this ruling, the throttling percentage took a dive from nearly 50 percent to only 3 percent in 2010. In the first quarter of 2012, Comcast’s throttling level was still at 3 percent, which puts the provider among the best behaving ISPs. Throttling was also greatly reduced at Charter over the last year, from 11 percent down to 4 percent. Cox is exposed as the most heavy throttler among the major ISPs, but with 6 percent this is still rather acceptable. In the UK BitTorrent throttling in on the rise, at least among some providers. BT is the worst offender by limiting 65 percent of all BitTorrent transfers during the first months of 2012. This is up from 57 percent last year and almost twice as much as the 35 percent in 2010. At O2 and BSkyB BitTorrent users are better off with throttling percentages of 2 and 4 percent respectively. For O2 this is a significant decline compared to their 13 percent last year. Virgin Media sits somewhere in the middle after it interfered with 22 percent of all BitTorrent transfers in the first quarter of 2012. This is down from 33 percent during the same period last year. Canada is not the most friendly country for BitTorrent users. Nearly all of the major Internet providers are heavy throttlers and Rogers tops them all. For more than half a decade Rogers has continuously throttled more than three-quarters of all BitTorrent traffic. During the first quarter of 2012 the provider interfered with 80 percent of all BitTorrent transfers, showing that there has been no improvement. Bell is a good second with 77 percent, up from 56 percent last year. BitTorrent users in Canada are best off at Cogeco and Telus with 3 and 0 percent respectively. BitTorrent is extremely popular in Australia, but according to the Measurement Lab data ISPs are throttling less than last year. iiNet is the worst offender interfering with 11 percent of BitTorrent downloads during the first months of 2012, down from 32 percent last year. Dodo hasn’t been caught throttling at all in 2012, a healthy improvement compared to the 14 percent score last year. The rest of the Aussie ISPs are also throttling considerably less than in 2011. A quick look at some other countries shows that in Sweden none of the large ISPs have been throttling BitTorrent traffic heavily so far in 2012. The same is true for other European countries such as France, Italy, Spain, Poland and the Netherlands. In Germany, Kabel Deutschland limited more than one-third (37%) of all BitTorrent transfers, a major improvement on the 69 percent from a year ago. For Brazilian BitTorrent users Net Servicos appears to be the worst option with a throttling percentage of 13, and in Japan Infoweb Fujitsu and J:COM should be avoided with 60 and 83 percent respectively. If we haven’t mentioned your Internet Provider here, a full overview of all the data is available here. If you want to know whether your BitTorrent traffic is being limited you can test your connection with the Glasnost tool. For those BitTorrent users who have a choice, the overview may help to make the right decision when signing up with an Internet provider.